The "Piano Man" by Billy Joel is one of my all time favorite songs, by one of my all time favorite artists. 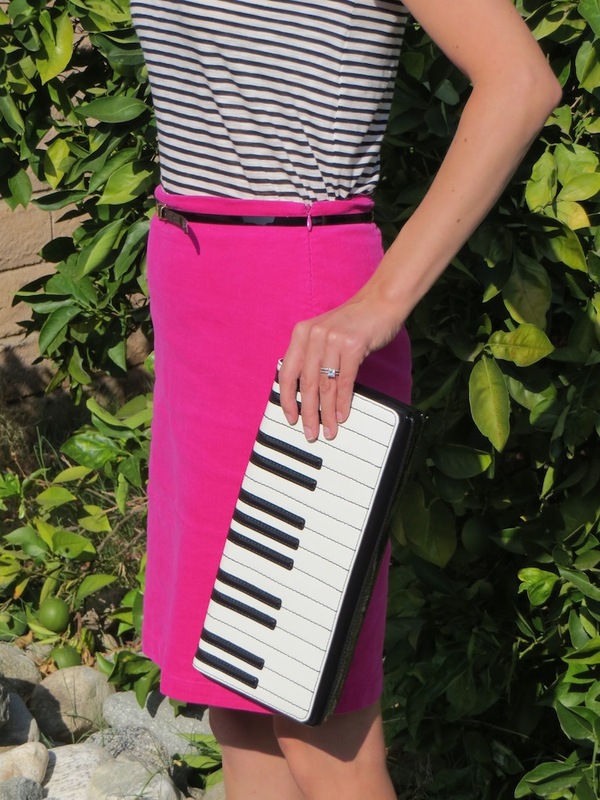 The Kate Spade Piano clutch will have you signing this little ditty all day long. I paired my piano clutch with a striped T-shirt and cashmere sweater from J. Crew and the new corduroy pencil skirt (known as the perfect cord skirt) from Old Navy in a color they call raspberry punch. For those of you looking for a review on the Old Navy perfect cord skirt, I'll share a few thoughts. First, I love the color. Second, it is pretty thin which can be expected given its low price. On the upside, the thinness of the fabric does make it a nice transitional piece for fall. At about $17 it's not J. Crew, but it'll work! Now, back to the good stuff. The clutch! Kate Spade is the queen of what I would call quirky statement clutches. I have been coveting a few for quite some time now, but missed out on them or in the case of the Kate Spade book clutch, I was guilt tripped into returning it by my husband. This particular clutch was offered by the Kate Spade outlet a couple of months ago and is slightly different from the one offered in stores a few years back. The thing I like best about this clutch is that it is pretty roomy. You could easily fit all of the essentials in it, which is a must! 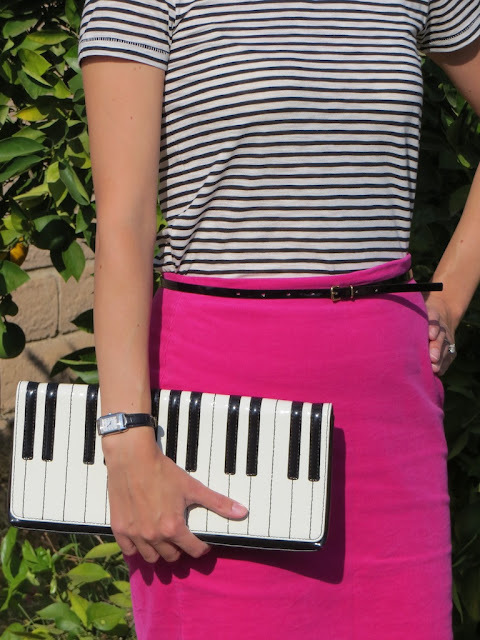 It is also prefect to wear as a conversation piece to any event involving musical instruments. It would have come in handy for perhaps the Huey Lewis concert I went to this summer or a night at the Hollywood Bowl. But the one place it would be absolutely perfect is a Billy Joel concert! What a cute clutch! Nice outfit, too! Thank you so much gracefully50! I appreciate you checking out my blog too! 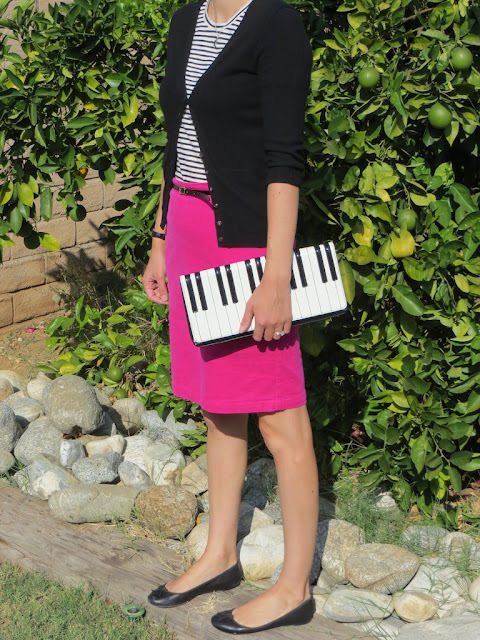 That clutch is fantastic fun - I adore it paired with the berry hue of the skirt. Thanks Lisa! I can't resist a fun, whimsical clutch!